Non-transactional persistent resource managers are tricky in context of database fail-over. A short discussion shines the light on some of the problems. File systems and queuing systems are in general non-transactional persistent resource managers that are typically used outside transaction control, in many cases because the technology chosen does not support transactions in the first place (some implement transaction functionality, many do not; here I focus on those that do not). Files can be created, deleted or their contents manipulated; queue elements can be enqueued or dequeued from queues (in FIFO order, priority order, or any other supported queuing policy). Because operations like inserting, updating or removing data items from non-transactional persistent resource managers are executed outside transaction control, they (a) cannot be coordinated in the same transactions of transactional resource managers, and (b) in case of a failure, the state of the data items is unclear since the non-transactional resource manager does not provide any transactional guarantees in failure situations (see the appendix below for the taxonomy on data consistency). For example, when a data item is enqueued in a queue and in that moment the queuing system fails (by itself or because the underlying hardware failed) then there is no defined outcome for that enqueue operation. It could be that the data items is properly enqueued and all is fine. It is possible that the data item was not enqueued at all. Worse, it might be possible that the data item was enqueued, but not all supporting data structures were fully updated inside the queuing system, leaving it itself in an inconsistent state still requiring recovery actions. From a software architecture viewpoint, non-transactional persistent resource managers are best-effort systems and this has to be kept in mind when they are used and deployed. With the rather reliable hardware servers nowadays this limiting property can easily be forgotten or pushed aside as the mean time between failures is rather long. However, when data consistency is critical, and non-transactional resource managers have to be used, effort can be put in place to mitigate at least some of the potential data consistency problems. A fairly straight-forward approach to integrate non-transactional resource managers is to store the data items twice: once in the non-transactional resource manager, and once in a transactional resource manager. Any update or delete must take place in both systems (however, as discussed, cannot be done inside a single transaction across both). For example, every item enqueued in a non-transactional queue could also be inserted into a relational table. If an item is dequeued, it is also removed from the transactional table. The logic could first enqueue the data item into the queue, and when successful, insert it into the table. Upon dequeue, the same applies. The items is first dequeued from the queue, and if successful, removed from the table. The invariant is that a queued data item is only considered consistent if it is enqueued in the queue and also present in the table at the same time. Enqueue succeeds, but system fails before the insert into the table took place. Enqueue succeeds, but insert in the table fails. In the first case, the enqueue fails and the insert into the table will never take place. So the invariant is fulfilled. In the second case the item is in the queue, but not in the table. The invariant is violated. The system can now decide how to deal with the situation after the failure: it can remove the queue item, or it can insert it into the table. The same situation occurs in the third case. Underlying this approach is the requirement that it is possible to check for the presence of the data item in the non-transactional as well as transactional resource manager in order to determine if the data item is present after a failure. For example, in the second case above, after the systems comes back up, the following check has to occur: (a) for every item in the queue an equivalent items must be in the table and (b) for each item in the table there must be an item in the queue. If there is a data item in one, but not the other resource manager, the invariant is violated and the inconsistency has to be removed by either removing or adding the data item so that none or both of the resource managers have the data item (and therefore the invariant holds). When a database fails over, as discussed in earlier blogs, it is possible that no data loss occurs. In this case the transactional resource manager remains consistent with the non-transactional resource manager. However, a data loss is possible. This means that one or more data items in the transactional resource manager that were present before the fail-over are not present anymore after the fail-over. In this case either the items need to be added to the transactional resource manager again (based on the content in the non-transactional resource manager), or they have to be removed from the non-transactional resource manager also. The particular strategy is to be determined in a specific software architecture, however, with data duplication this choice can be made as needed and required by the application system at hand. The outlined approach above (which can be applied to any non-transactional resource manager that can check for the existence of data items) fundamentally makes the non-transactional resource manager pseudo transactional by pairing it up with a transactional resource manager. This is implementation effort made in order to provide data consistency. Less effort might mean less consistency. For example, it would be sufficient to store the data item in a table only for the duration until the data item is safely enqueued in the queue. Once that is the case the data item could be removed from the table. While this would ensure the consistency during the enqueue operation, it does not ensure consistency during the dequeue operation since not every type of failure during a dequeue operation would be recoverable. In a data loss situation because of a database fail-over there would be no way to reconcile the two resource managers if not all data is available in both at the same time. In a particular situation that might be acceptable, but in general it would not. Additional effort takes additional resource, both in storage space as well as processing time. The price for making the system more consistent is a possibly a slower system, with less throughput, and higher storage space requirements. Again, this is trading off non-functional with functional properties. The outlined issues are present in all systems that deploy non-transactional persistent resource managers. The outlined solution is a generic one and in specific situations alternative, more efficient approaches might be possible in order to guarantee data consistency. As discussed, the choice of non-transactional persistent resource managers paired with the need for data consistency can be expensive from an engineering and system resource perspective. While the choice is not always a real choice, it is definitely worth evaluating alternatives that provide the required functionality in a transactional resource manager for comparison. This blog is the last in the series around transactional and non-transactional resource manager use in context of database fail-over. Clearly, the software architecture has to be aware of the fact that a database fail-over is possible and that a data loss might occur along the way due to network errors, increased network latency and system failures. Some of the architectural problems have been discussed, and some solutions presented as starting points for your specific application system development efforts. If transactional resource managers are available, then all is good (see last blog). But what if this is not the case? This blogs starts discussing non-transactional resource managers. Non-transactional and persistent. Data is stored on persistent storage, but outside transaction protection. Non-transactional, non-persistent and non-rebuildable. Data is managed in volatile memory, outside transaction protection, and if lost it cannot be rebuilt (it will be truly lost). Non-transactional, non-persistent and rebuildable. Data is managed in volatile memory, outside transaction protection, but can be rebuilt if lost or intentionally deleted. A non-persistent resource manager is usually called a cache. An example of a cache is a list of values in a Java singleton caching a subset of the data of a database table column. Another example is the user interface that caches a list of entries like sales opportunities and displays them to a user. Proper implemented caches can be invalidated (aka, emptied out) and rebuilt based on data stored in one or several database tables as they are non-functional components put in place for performance reasons. Caches that can be invalidated are called “rebuildable caches”. Caches that cannot be invalidated without loosing data are called “non-rebuildable caches”. Those should not be part of the software architecture and have to be avoided as lost data cannot be recovered. The impact of this is clear: you don’t want your checking account information be managed in such a cache. In the following caches are discussed; the third type of resource manager, non-transactional and persistent, is going to be discussed in the next blog. A rebuildable cache contains copies of data from the database. If a cache is accessed and it contains the requested data (“cache hit”), then the data is returned to the caller. If the cache does not contain the requested data (“cache miss”) the cache fetches the data first from the database and stores it before passing it on to the caller. In summary, the cache either has the data or knows how to get it from the database. In context of a database fail-over it is possible that the primary and secondary database have the exact data set at the time of the fail-over [see blog https://realprogrammer.wordpress.com/2015/08/31/software-design-in-context-of-database-failover-part-2-software-architecture-taxonomy/]. In this case the cache contents remains consistent with the database state after a fail-over as all data in the cache has a corresponding data item in the database. However, it is possible that a data loss occurs if the secondary database is lagging the primary database at the time of the fail-over. In this case some data might not be available anymore after the fail-over as this data was not replicated before the fail-over occurred. A cache that has data that was available before the fail-over, but lost during the fail-over is therefore inconsistent with the database after the fail-over. A cache hit might occur, however, the cached data is not in the database. This would be incorrect behavior since the premise of a cache is that it caches data consistent with the database state. The solution for the fail-over case is that all cache entries are invalidated (from all caches) right after the database fail-over took place before clients continue processing. Since each cache starts empty, many accesses will be a cache miss initially until the caches have built up the working set again. However, the caches will be consistent with the database state and the application system accesses consistent data. From a software architecture approach is it very important to be able to know all implemented caches and ensure that each is a rebuildable cache. Even if not desirable, non-rebuildable caches might exist and the cache invalidation functionality discussed above is not available. If the cache cannot be invalidated it is impossible to remove its contents after a database fail-over. Therefore it might be that the cache returns data to the client that is not present in the database anymore or not consistent with the data in the database. The client would have to be aware of this possibility and able to deal with such an inconsistency. A special case needs to be discussed. It is possible that a non-rebuildable cache stores data from the database, but it is only missing the externally available functionality of cache invalidation. So in principle it could be rebuilt, but the rebuilt cannot be externally triggered due to a missing programming interface. A possible approach in this case is to try to implement a workaround that is based on the assumption that a cache has limited capacity and that there is a lot more data in the database than the cache can hold. A brute force attempt to make the cache consistent again would be to implement a client after fail-over that requests every data item that is in the database from the cache. At some point the cache will be full without any capacity left and as a consequence the cache has to evict entries. As this happens, inconsistent entries will be removed to make room for those the client requested and caused a cache miss. Once all data was requested, the cache is consistent again. Despite workarounds in special cases, there is no general approach that can address non-rebuildable caches. They have to be avoided if transactional consistency is important as consistency with these caches cannot be provided. If caches are used in the software architecture, the best form is rebuildable caches that can recreate their state from persistent storage (aka, database) so that a consistent data state can be recreated after a loss-ful database fail-over. Those must have external interfaces so that an invalidation can be triggered right after the database fail-over completed. Non-rebuildable caches might be managed in special cases with a workaround after a fail-over, however, as no general mechanism exists, they should be avoided altogether. Avoiding non-rebuildable caches is a safe architectural approach. The next blog will discuss the third category of resource managers: non-transactional and persistent resource managers. Oracle Active Data Guard provides a replication and fail-over mechanism between two or more Oracle databases for high availability and disaster recovery. How does (application) software have to be designed in this context? In a nutshell, Oracle Active Data Guard [http://www.oracle.com/us/products/database/options/active-data-guard/overview/index.html] provides synchronization between a primary database and one or more secondary databases. It continuously replicates the primary database to all secondary databases based on in-memory redo logs and their transmission. There are several protection modes, which are variations of synchronous or asynchronous replication between the primary database and the secondary databases. Secondary databases can be in the same data center (high availability) or different data centers (disaster recovery) and the specific deployment topology depends on the degree of availability and protection the organization implements. Because the primary database is replicated to secondary databases, clients accessing the primary database can fail-over to one of the secondary databases if the primary database becomes unavailable. Clients therefore switch over from the primary database to the secondary database for processing. Initiating the fail-over process can be manually or automatically triggered, depending on the configuration chosen. In case of synchronous replication the secondary databases are in lockstep with the primary database and contain the exact same state. In case of asynchronous replication a minor delay might be possible between the primary database and its secondary databases and the secondary databases might lag a few transactions behind; their state is therefore not the same but consistent as of a earlier time. Active Data Guards’ synchronous replication ensures that the secondary databases are an exact replicas of the primary database. In terms of transaction execution this means that a transaction is committed successfully on the primary database only if it is committed on all secondary databases as well. The benefit of exact replication (aka, no data loss) comes with the cost of transaction execution time as a transaction on the primary database only succeeds after the secondary databases have executed the same transaction. The primary database is therefore dependent on the execution behavior of the secondary databases. In the following a partial site failure is assumed. This means that the primary database becomes unavailable, however, the applications that are accessing the primary database continue to be available. A (complete) site failure occurs if all systems, primary database and all applications, are unavailable. 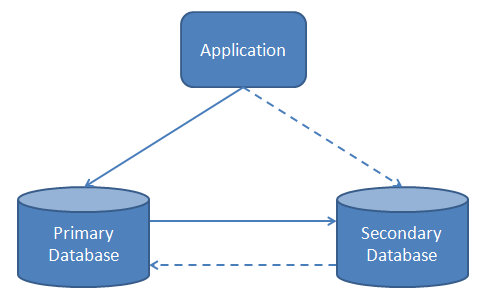 The following shows the various components (a primary database, a secondary database, and one application). The solid arcs represent the call relationships before a fail-over to the secondary database, the dashed arcs represent the call relationships after a fail-over to the secondary database. In this blog the “Happy Path” is assumed. This means that all database processing that the application performs is done in individual complete OLTP transactions that always commit consistent transactions. After each transaction the database is in a consistent state. In the case of complete OLTP transactions it is assumed that no data is cached in application layer caches or stored in other non-transactional resource managers, like file systems or queuing systems. This style of OLTP transaction processing application serves as a design baseline for this blog and the future blogs in this series. For the complete OLTP transaction applications no specific software design rules apply for the fail-over scenario outlined above (except for not using any other non-transactionl resource managers like caches, queues or file systems). Since all transactions are committing consistent data, and since the replication mode between primary database and secondary database is synchronous, the application will find a consistent and complete database state in the secondary database after a fail-over. Furthermore, Oracle Active Data Guard provides driver-level functionality that allows an application to fail-over without having to implement application level code that accomplishes the fail-over; instead, the drivers are able to fail-over without the application having to be aware of it. For complete OLTP processing no specific software design approaches or software design rules have to be taken into consideration when using the synchronous replication mode in context of Oracle Active Data Guard. However, the “Happy Path” is not the only possible application type and more complex application software systems in conjunction with other Oracle Active Data Guard replication modes will be discussed here in forthcoming blogs, especially when non-transactional resource managers are involved.